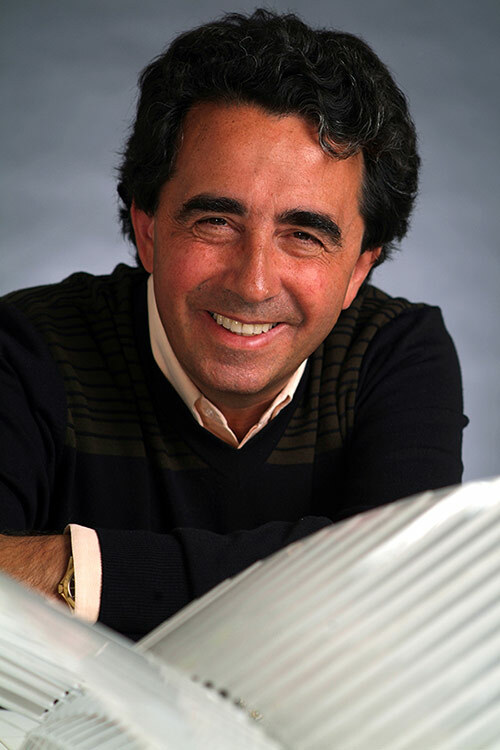 With the World Trade Center site incrementally becoming more a part of Lower Manhattan, and the blades of the Transit Hub peaking interest from behind the fence, Santiago Calatrava sat down with former AN executive editor Alan G. Brake to discuss the civic role of his architecture, which he hopes will rank among New York’s great infrastructural works of the past. 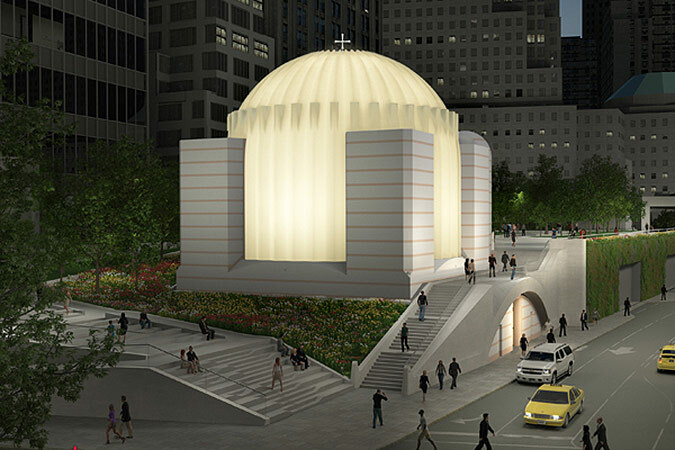 He is also completing the Greek Orthodox Church at the south side of the site, his first religious structure, which is scheduled to open for Easter 2017. Alan G Brake: You’ve been working on the World Trade Center site for a long time, what do you think of how it’s coming together as an urban composition, now that people are able to access it more? 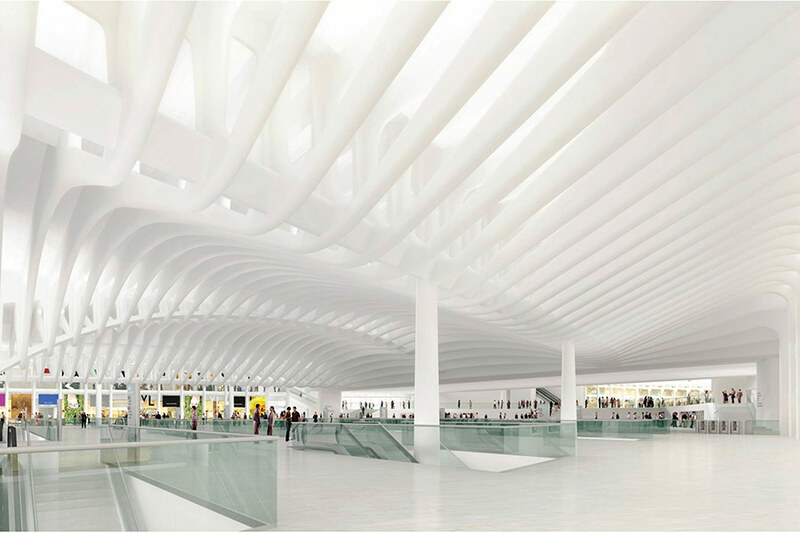 Santiago Calatrava: You see, it’s a little bit early to judge it. Fulton is not yet open. Greenwich is also cut in two, or is only accessible at one end. And at this point the platform where the Greek Orthodox Church is is still a construction site. Even the skyline is not finished, but in any case it’s very promising. You see that the site will be concluded. Once Greenwich is open and you have the church in place and then the skyline is concluded and the PATH is working and the plaza we have done is also accessible, it will become a very interesting site, just from the pure urban point of view. You see I always considered my project from beyond just the architectural aspects and the engineering aspects—very much from the urban point of view. The mezzanine under the 1 and 9 [subway] is like a plaza. The oculus is like a plaza, very light with open views out to the skyscrapers. My project was always about the urban configuration and even complementing the original master plan. I proposed detaching the station from Tower Three and making it an autonomous building in a plaza, which was different from the master plan. My approach has been looking at it as a contribution to the city. I think the whole scheme with the memorial gardens and the enormous towers is very powerful, and also the station is like one block of New York with a plaza around. We create a lower scale, it brings the scale of towers to the scale of the pedestrian. The East/West Corridor has opened, and it’s giving people a preview of what’s to come. How does it relate to the larger composition of the station? I tried from the very beginning to do that whole network of connections extending from the oculus as a single unit. So the character of the structural members you can see with the ribs, and a certain character in the paving, and a certain character in the front of the shops is already delivering a character that a person will see all the way through. So if you are in the oculus or the mezzanine, or in the other corridors to Liberty Street or the other internal streets towards Liberty Plaza, or towards Wall Street or towards Fulton, all these areas are marked with the same character. My goal is to create a space where as soon as I arrive in the transportation hub I know I am in the transportation hub, no matter what corner I enter from. Also, something that the corridor delivers is a sense of quality of spaces. I have built seven of the major transportation hubs in Europe, in Lisbon, in Lyon, in Zurich, in Italy, and so on. Getting out of this experience, it’s very important to create places of quality, because people behave according to that. You see after all the enormous effort to bring all the subways and the trains to this place and see to maintain the service through all the construction—why shouldn’t these places have a certain material and structural quality that you can enjoy in a day-to-day way, not just commuters but visitors who arrive in this place. I think the station will match with the tradition in New York of great infrastructural works, as you see today in Grand Central and in the former Penn Station. If it had not been demolished it would be recognized as one of the greatest stations worldwide. I hope people can see some of these material qualities in the East/West corridor. The development of the World Trade Center site as a whole has been very complex, and there have been a lot of delays, and changes of authority and ownership. Can you talk about how that has impacted the transit hub and what you have fought to keep through all those changes? The transit hub is more than just a series of stations that are linked together, and maybe that is difficult a priori to understand. It is conceived to represent all the transit access to the towers, also all the vehicular access of cars and lorries, it represents the energy center for many of the towers, for the museum, the memorial. The transit hub is also the basement of Towers Two and Three. The first three or four floors of Tower Three have been built as a part of the Port Authority’s commitment. It is also the support for the memorial plaza. It is the support to the entry to the museum, and the support for the future art center. 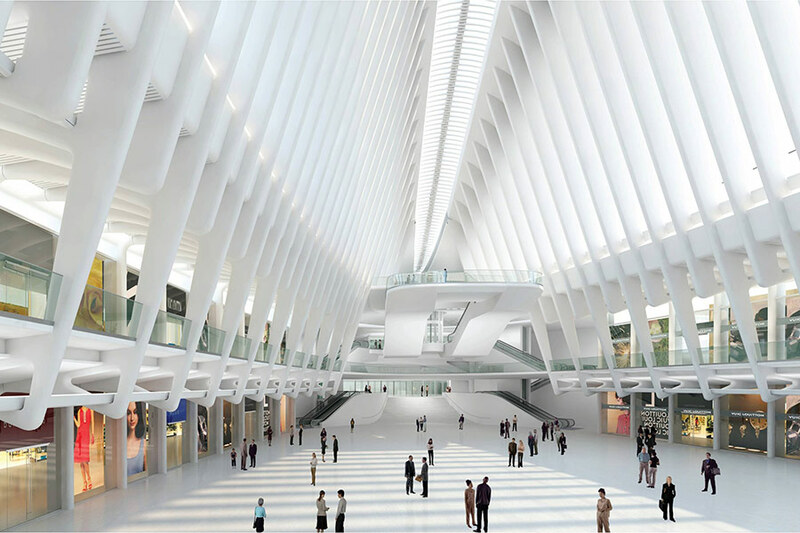 All these things will let you understand materially what extends into the transit hub. It is also the 1 train diagonally crossing the site, which we have had to underpin, and keep in service the whole time. All of this has been done while fully preserving service of the subway lines and the commuter trains to New Jersey. To build the hub has been an enormous challenge. Your work has often been described as cathedral-like. 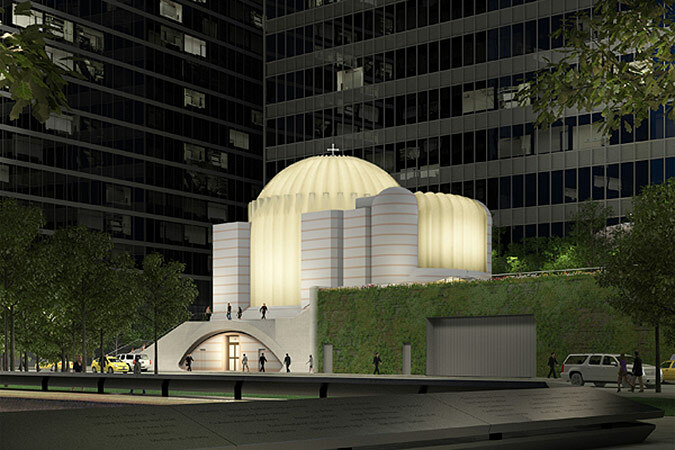 What has it been like to work on your first religious structure, the Greek Orthodox Church? I have been working in Greece for a number of years because of the Olympics in 2004, on the Olympic Ring covering the stadium and the velodrome. So I have an enormous sympathy for the culture and for the Greek diaspora. I discovered the beauty of the Orthodoxy. I knew Hagia Sophia, but I had never approached it from a religious point of view. I approached it as you approach the Parthenon. You can study it. You can buy books. But you can never fully understand it as a religious place. If you look at the project, it’s very anomalous with the rest of my work. I’ve never used a dome before, except in the competition for the Reichstag in Berlin, where I proposed a dome. Also there is the problem with scale, simply because the building is very small. The restraints that the Greek Orthodox Church negotiated with the Port Authority and the Lower Manhattan Development Corporation is a small building where the height is limited, the width is limited. But I knew that the monumentality was important. It will bring an accent to the site, as the entry to the PATH will do. This building will bring you a relation to the scale of the person because they have almost a domestic scale. I like that. We try with these two buildings to give a sense of the human being, the scale of man. It’s like a three-story house. I have to say it was a great idea from the Port Authority and the church to put it on a podium, which is the vehicular entry for security screening. It’s a small church floating above an oak forest. The oaks will not become enormous because they are in planters. I like this scale in relation to the pools of the memorial. We came up with this idea of making the dome out of translucent stone, so the light from the interior will have a little glow. It will never be excessive, but it will help give the impression of a 24-hour open place. So that people who need help, they will be able to find a place to go. Finally, the interiors, we are trying to do a place for everybody, an open place. So it won’t have heavy religious iconography? Certainly it will have the necessary iconography to officiate the liturgy. People can enter and light a candle if they are believers or not believers, if they are Christians or not, they can light a candle close to the memorial. There has been a certain architectural language that runs throughout much of your work. Can you talk about the shared language of the church and the transit hub, and what you are working toward in terms of light, space, and structure? I am also an engineer. If you look at my work, there is a very marked presence of structure. This is without any doubt the case with the hub. All these beams are steel and they are carrying the weight. The structure is used as an expressive element. So if you look back at all of the transportation hubs and railway stations in Europe, this is the case. In the hub you see the idea of bringing in light and making a very clear place. I employ it because it is also a matter of comfort. In places with high levels of security concerns, the feeling of safety is not only an objective feeling, it is also a subjective aspect. So a woman waiting for a train at midnight when the station is not so busy has to feel comfortable. For that, the ambience of clarity. Also orientation, if you take the East/West corridor as you see today you end up in the Fulton corridor. And you can see that optically through, because easy orientation, particularly in chaotic or dangerous circumstances is the most important aspect. So I am mixing architectural aspects—the color and the light—with functional aspects and the sensation of comfort for the users and also the quality of the spaces. It’s interesting to compare with the Greek Orthodox Church. These aspects are much more mitigated because we’re not making an expressed structure. We’re trying to make a building that is expressive through the relation of the volumes. So I am stepping into a more complex and maybe a more classical aspect of architecture: the game of the volumes and delight. There are the four towers, the front facade, and the dome. Not the expression of the nerves or the tendons or the muscles of the body, but an expression of the relations of volumes and proportions, related to the person. It is much more classical. The Hagia Sophia, why is it what it is? You see the effort of carrying this enormous dome, but you do not feel it in the interior—it is all sublimated by the light. And also you enter the narthex and the anti-narthex and then into the nave. It’s a continuous crescendo. We also have this in our building.